How long do dental implants last, how long do dental implants take to heal? And also: How long do dental implants take to heal? Home » BLOG » Teeth implants » How long do dental implants last? When you have to replace a tooth or you need a denture, you should consider getting dental implants. Probably one of the first questions to come in mind is: how long do dental implants last? How long will it stay in place? Will a replacement be necessary? Or, once it is in place, will we have nothing more to do with it? What happens if the implant falls out after the implantation ? How long do dental implants last if they are well-ossified? How should we take care of the implants so that they last for a long time? In contrast to other dental restorations, if you choose implantation, there is no need of preparation for adjacent teeth. Also, a dental implant can restore 95% of your original chewing ability in a given area and thus prevents bone loss. Consequently your digestion will be better, your appearance will be more aesthetic, and you will feel confident again. With proper care, the implanted teeth can be equivalent to your own, natural teeth. There are about 220 implant types on the market, so you should not only choose on a price basis. Dr. med. dent. László Mozsolits recommends to trust your dentist, and choose what he proposes. There are some implants in the high middle price category, which are of high quality. Since the implants are made of titanium, you need not fear rejection or allergic reactions. Not every patient is suitable for a dental implantation: there are general contraindications such as cardiovascular disease, diabetes – especially if they are not treated. We must also mention smoking, as it results in slower blood circulation in both the bone and the mucosa, and thus lowers the chances of recovery and shortens the lifetime of the implants. Under the age of 18, implantations are not performed as the jaws are still in development. According to Dr. Mozsolits, it is advised not to perform the operation on patients with unstable psyche – such as panic patients, or patients who suffer from depression –, because they often have unrealistic expectations regarding the results, which could lead to other psychological problems. As the first step, the dentist must establish whether the patient has a sufficient quality and quantity of bone mass. If they do not, then a bone augmentation is necessary, but it prolongs the duration of treatment to six months. 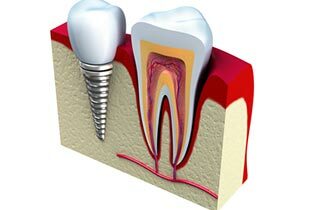 Only after the bone augmentation can the dentist place the implant to replace the tooth root. Without bone augmentation, the treatment requires about three months. After the healing period, the dentist can complete the implant: he exposes the inserted artificial root and takes an impression of that area of the dental arch. In base of this impression the replacement is manufactured in the dental technical laboratory. There are many replacement possibilities, from bridges to telescopic dentures. What happens if the implant falls out after the implantation? This is highly improbable. Only in a small percentage of properly prepared implantations does something go wrong. When for some reason the body is not responding well to the implant, an inflammation may occur in the affected area, therefore the removal of the implant may become necessary. Once the affected bone has healed, there is the possibility of a re-implantation. How long do dental implants last when they are well-ossified? The first implantation took place in the sixties and remained in the mouth of this Swedish patient for 41 years; until his death. There is no lifetime warranty on implants, but with proper oral hygiene, a healthy diet, regular dental check ups and no smoking and no alcohol, the patient can preserve the implants for a long time. Our patients get a warranty of 10 years on their implants. Implantation can be a lengthy and costly process, but if patients comply with the instructions from the doctor, they can preserve the replacement teeth for many years.